We provide a reliable and professional window cleaning service throughout Exeter, Exmouth, Sidmouth and the surrounding areas in Devon. Over the years we have received many positive reviews from our window cleaning service. Take a look below at what our customers have had to say about us. "Delighted with today’s work on my windows. Excellent service, polite courtesy and efficient execution of the job. Hardly realised he was here but the shining result and clean-ness much appreciated. " "Thanks team - what a professional, friendly service. The special window cleaning kit reached all the tricky windows and left an old conservatory roof looking like new. Recommended. " "Busy Bees came and cleaned my windows. I'm thrilled with the results, not only clean windows but the frames and front door too"
"Absolutely fantastic service, polite, friendly, professional. Would definitely use Busy Bees again. " 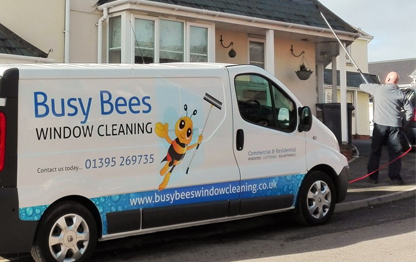 "Busy Bees are friendly, reliable and professional and having had so many bad experiences with previous window cleaners, I am very relieved to have found them. " "What a great team! My elderly parents house was in great need of a cleaning blitz. John and his team arrived at 8.15 to a mess and when they left at 5pm we had a sparklingly clean house. I would highly recommend them. " "Just to say a massive thank you and to give the gentleman who came and completed the job a massive pat on the back. He was extremely polite and explained the work that he completed and asked me if I was happy. I was over the moon with the job that he did and will certainly be recommending you to all our friends. " "Our house looks like new again. Jesse did an amazing job on our UPVC, gutters and windows. Busy Bees were recommended to us by our friends and will be certainly passing on their name to others. " "I'll be honest. I'm no different to the next person, lovely clean home & yet we neglect our windows. Came home from work today to spotless windows, first time outside has been done in a year. Even better, a nice easy slip through the door with their payment details, meaning no need to wait around! Couldn't recommend more highly! " "Fantastic service from initial phone call to coming and doing the work, very professional and friendly service, highly recommend. " "Our windows now shine, the hot pure water system that Busy Bees use certainly gets great results. And good to have a window cleaner that comes when they are expected. Thank you. " "The work carried out was to a very high standard. I would recommend Busy Bees to everyone." "The external and internal condition of our windows and doors was beginning to affect our image, which is crucial for a leading marketing company. BBWC have exceeded our expectations in service quality and professionalism. Our premises now reflect the standard of business we deliver to our clients. " "In the past, we've had window cleaners who turn up when they want, use cold dirty water to whizz round and move on. These guys are different. our windows have NEVER looked so clean! they took their time and did a thorough job. signed up for monthly clean. well, well worth it! thanks guys! "